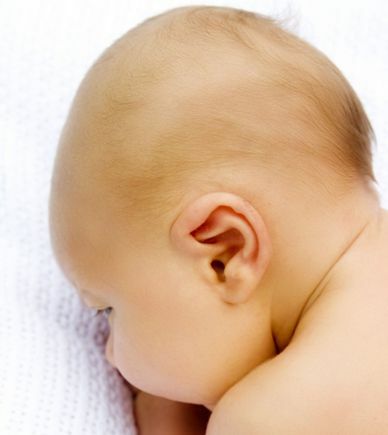 Ear infections, a fairly common occurrence in infants, are caused when there is an inflammation of the middle ear which is the cavity behind the ear drum. When an ear infection does not heal in time or if the infection continues to reoccur (recurring), it is said to have become chronic. Chronic ear infections are called chronic otitis media. The middle ear produces secretions which usually drain out through the eustachian tube to the throat. The eustachian tube is also critical for maintaining airflow through the ear and equalizing air pressure, which is essential for balance. When the fluids don’t drain properly, the bacteria present in the fluid gives rise to an infection. Children are more likely to suffer from ear infections because the tubes are smaller and at a similar horizontal level hampering drainage, most often when the tubes are swollen or blocked with mucus from other illnesses like the flu. The ear infections typically occur with regularity in children under the age of 3 years. Doctors today usually have a wait-and-watch approach towards ear infections in infants with symptomatic relief since the infection often clears up on its own. When this condition continues, specific treatment for the infection needs to be undertaken. For treating chronic infections, the doctor may prescribe a course of antibiotics. When the infection fails to responds to the antibiotics, fluid builds up in the middle ear remains for longer time or hearing loss begins , a minor surgical procedure (Myringotomy)is advised. Myringotomy the surgery is especially recommended for infants since having persistent fluid in the ear might impact their hearing and speech development. Under this surgery, a small ventilation tube or grommet, made of metal, plastic or Teflon, is placed in the eardrum to help drain the fluid. The tube releases pressure and acts as a vent until the eustachian tube returns to normal functioning. Myringotomy is simple, low risk and takes less than half an hour. The surgeon makes a small incision in the eardrum, drains the liquid and then places tiny tube connecting the middle ear and the outer ear. The surgery is usually done in both ears and is called bilateral myringotomy. The surgery significantly reduces the pain, the severity of symptoms experienced, and over time reduces the infection and its reoccurrence. Any loss in hearing is often restored. The tubes, which are invisible, stay for six to nine months and usually fall out by themselves. At times, the infection reappears in which case the procedure would need to be repeated. If left untreated for long, chronic ear infection may, in addition to causing hearing loss, also affect other areas of the ear such as the small bones in the middle ear or the eardrum itself. Surgical procedures are also needed in these cases to repair them. Popularly known as ‘glue ear’, Otitis media with Effusion or fluid in the middle ear is the commonest cause of hearing difficulty and most frequent reason for visits to Otorhinolaryngology (ENT) clinic in children. More common during the age when child is developing speech and language skills by hearing to his surroundings, because it is not painful, it may present as speech and language delay or defects. Children have shorter and more horizontal tubes and immune system are not well developed, that is the reason which explains more common ear infection in a child. If Eustachian tube gets blocked because of some reason middle ear air replacement fails and potential vacuum forms, this vacuum draws fluid inside the middle ear. This could be basis of effusion in Baro-trauma, adenoids, viral infections (as evidenced by association of OME with influenza), second hand smoke, allergy, immunological factors, birth defects(such as cleft palate), cystic fibrosis, or cilia abnormality (as in Kartageners syndrome). In some cases Eustachian tube is patent; here other factors like increased mucus production in the middle ear as is seen in upper respiratory infection or allergy, may play a role. Benign and malignant tumor should always be ruled out in adult having otitis media with effusion in one ear. There is high rate of spontaneous resolution; most episodes are short lived and 75% of cases resolve in 3 months so normally a ‘wait and watch’ policy is advised. Child is kept under observation with regular follow ups for first three months. If condition lasts longer than 3 months, a hearing test is conducted and child re-evaluated. If hearing is within normal range (below 20 decibels) child is prescribed with antibiotics and kept on periodic check-ups for 4-6 months. Management is aimed to encourage natural process; useful measures are control of environment factors, management of allergy, nasal decongestant drops, and Valsalva’s maneuver (Forced expiration with both the mouth and nose closed à Increased air pressure in nasopharynx à opening of the Eustachian tube). Child is considered for surgical treatment if OME lasts for more than 4-6 months, or there is hearing loss more than 20 decibels or child is at risk of developmental delays because of recurrent problem. Mainstay of treatment is myringotomy (a small incision is made in ear drum and fluid is suctioned out) and placement of ventilation tubes (Grommets). Procedure takes less than 30 minutes, ear tube falls out after few months and incision heals spontaneously. Ear tube relieves pain and restores hearing. There are chances of relapses in 20%-50% children and tube placement may have to be repeated. Sometimes removal of adenoids is to be done along with tubal placement. Well balanced healthy diet with fresh fruits and vegetables rich in antioxidants and lacto bacillus. Studies have evaluated that antibiotics and other medicines have short term effect and no long term cure. Putting ventilation tubes is effective but some newer studies have questioned the role in view of spontaneous resolution and frequent need for repeat tubal placement. Several studies are being conducted but there are still so many unanswered questions and still need for proper research.